Scientists at Johannes Gutenberg University Mainz (JGU, Germany) have studied natural claystone in the laboratory for more than four years in order to determine how the radioactive elements plutonium and neptunium react with this rock. The experiments have been performed as part of a Germany-wide project sponsored by the Federal Ministry of Economics and Technology (BMWi) to find a suitable geological repository for radioactive waste. Geological configurations that could play a role for the permanent disposal of nuclear waste include not only salt and granite formations, but also claystone. The results obtained by the team of nuclear chemists under the supervision of Professor Tobias Reich confirm that natural clay has certain useful properties that counteract the migration of radioactive materials. Professor Reich, director of the Institute of Nuclear Chemistry at Mainz University, summarizes the results obtained so far as follows: "It does seem that clay could be suitable as host rock, although we still need to wait for the outcome of long-term investigations." The cylinders of clay used by the Mainz team of nuclear chemists have come a long way: Cores of Opalinus Clay were obtained by drilling in the Underground Rock Laboratory Mont Terri in the Swiss Jura mountains. This clay formation was deposited some 180 million years ago. In Switzerland, Opalinus Clay is being considered as a rock formation for the storage of radioactive waste. The bore cores were first transferred to the Institute for Nuclear Waste Disposal (INE) in Karlsruhe, Germany, where they were cut in small round disks with a thickness of 11 millimeters. At the Institute of Nuclear Chemistry in Mainz, these clay disks were packed in diffusion cells and contacted with pore water containing radioactive neptunium or plutonium. 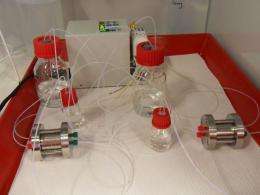 Other samples of clay were transferred to test tubes where a suspension of this material with pore water and the radioactive elements was agitated and centrifuged and then analyzed by highly sensitive mass spectrometers in order to determine the sorption characteristics of the clay material. Afterwards, the samples were transported to the particle accelerators in Grenoble, Karlsruhe, and at the Paul Scherrer Institute in Switzerland, where they were investigated by beams of synchrotron radiation with a width of only 0.0015 millimeters. "This provides us with detailed information on the distribution of the elements, and where and how the elements are sorbed on the clay material," explains Reich. The batch experiments show that radioactive plutonium in the oxidation state IV is nearly totally sorbed on Opalinus Clay, leaving almost no plutonium in the aqueous solution. In the case of neptunium(V), the corresponding ratio is 60:40. However, if neptunium is reduced to neptunium(IV) by iron minerals present in the clay, a near 100 percent sorption of neptunium on the clay is observed. The diffusion experiments using radioactive water have demonstrated that water passes through a clay cylinder with a thickness of 1.1 centimeters within a week. Neptunium, on the other hand, hardly diffuses through the clay, and even after a month it is still almost where it started. Thin, millimeter-wide sections of the clay disks also show which chemical reactions of the radioactive elements occur as they pass through the clay material: Plutonium(VI) is reduced during its passage through the clay cylinder and is recovered as plutonium(IV). "This is a great advantage, as plutonium(IV) stays where it is put." Professor Reich and his research team also discovered what is responsible for the sorption of the radioactive substances: It is predominantly the clay minerals, while the iron minerals responsible for the reduction process are only of minor importance in this connection. Opalinus Clay, which occurs not only in Switzerland but also in Southern Germany, thus appears to be an excellent candidate for further investigation on the migration of long-lived radionuclides - neptunium, for example, has a half-life of 2.14 million years. The Mainz team of nuclear chemists had previously reported similar results using the clay mineral kaolinite from the United States of America. "In the meantime we have developed the necessary equipments and have defined the experimental processes required," Reich summarizes the outcome of the experiments with Opalinus Clay. Over the coming three years, he and his team plan to investigate the behavior of clay in the presence of higher salt concentrations. The studies are being conducted as part of a project initiated by the German Federal Ministry of Economics and Technology in 1995 to find a suitable location for a nuclear waste repository. Eight research institutions are participating in the joint project entitled "Interaction and transport of actinides in natural claystone, under consideration of humic substances and organic clay materials" to investigate to what extent Opalinus Clay could be a suitable host rock for the permanent disposal of highly radioactive waste.